It is a well-known and much overlooked fact of His life - as known and overlooked as the lilies He loved. And it's a puzzling fact, too. Why lilies? Why especially lilies? Maybe He loved lilies for being white, the way many people love roses for being red. Maybe it was because of the brilliant green of their long, slender stalks or the glorious, darker green of their leaves. Maybe He loved them because their blooms looked like trumpets and their leaves resembled swords. It could have been their simplicity, it might have been their commonness. It may have been because of all of that and it just as easily could have been because of none of that at all. But it seems like He loved them. In the Sermon on the Mount - a sermon that predated the birth of Christianity, a sermon so profound and timeless that it would endure throughout the history of Christianity and would (in fact) shape and distinguish the character of everything Christian - Jesus pointed to lilies as examples of a splendor superior to that of Solomon's. He considered them to be better dressed than kings - lilies, that is (and a lily is one of the most naked flowers known to us.) He did not apparently blush or stutter when He commanded His followers to consider them. He gave that command with the same authority that He gave the command to "let your light so shine" and the command to "turn the other cheek." It is an astonishing command - maybe given because lilies are astonishing flowers or maybe given because Jesus was an astonishing man. After all, He had a certain fondness for sparrows and did not consider their care and feeding beneath the dignity of God - though God's care and dignity (Jesus would assert) is beyond the comprehension of men. It was God's Spirit that led Him into the wilderness where He fasted and spent forty days (Mark tells us) "with the wild animals." It is easy, considering this attitude about lilies and sparrows, to imagine (and yes, this is imagination and certainly not revelation) that He spent that time romping with those creatures, not cowering from them and thus in His person, partially fulfilling Isaiah's prophecy about a "peaceable Kingdom of the Branch." If this was the whole picture of Christ, we could easily write Him off as a nature lover with a heavy Hebrew orientation. But this is where the lover of lilies throws us a curve - He loved men. It was to the end that they might be saved that He came. This man who looked at flowers and loved them, also looked at an arrogant young human and loved him. He who romped forty days with the wild animals, spent and worked three years with yet a more savage and brutal species - man. He who rejoiced in God's providence for sparrows miraculously fed a crowd of 5,000 people on one occasion and 3,000 on another. His attention and affection was not won by the attractive and the beautiful - His glance and His love made things and people attractive and beautiful. The touch of His hand would give sight to the blind and from the hem of His garment flowed healing. And even if someone would (and why should they) doubt the accounts of His miracles, I can testify myself I had never seen a lily until He showed me one. I had never heard a sparrow until His voice unplugged my ears. I had never known love until I met Him... and He is love. So, all those things He did that we call "miracles" became believable to us because Christ, who performed them, operated out of love - and love (His love at least) has a height and depth and breadth and length that reaches beyond the dimensions of mere reason. And while reasons may be found within His love, no reason would be able to contain His love. It is possible that He loved lilies because He is love and that He feeds sparrows for the same reason. It is possibly that the evidence of His divinity lies in that love - that in light of love, miracles seem sort of unremarkable. If God can love me, the rest will follow. And Jesus Christ is, for me, the evidence of God's unreasonable and unsolicited attentiveness, His unearned favor, His incomprehensible love. is a type of Jesus Christ. A lily is a sweet and a flagrant flower with a strong scent. Jesus has a sweetness in His ministry especially when He gave "himself for us an offering and a sacrifice to God for a sweet smelling savour" (Ephesians 5:2). 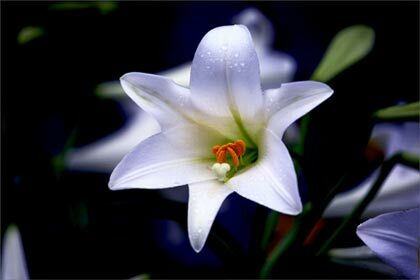 A lily is white and very beautiful; exceeding all other flowers for whiteness. Within it are seven grains or seeds that are the color of gold. White is a picture of purity (Revelation 3:4). The bride of the Lamb will be clothed in white (Revelation 19:8). What better representation of the purity of Jesus Christ, the one "who knew no sin" (2 Corinthians 5:21), who "did no sin" (1 Peter 2:22), who was tempted "yet without sin" (Hebrews 4:15), and who "in him is no sin" (1 John 3:5), than a beautiful white lily? "For such an high priest became us, who is holy, harmless, undefiled, separate from sinners, and made higher than the heavens" (Hebrews 7:26). A lily is very fruitful. One root may put forth fifty bulbs. Through the death and resurrection of Jesus Christ, He brings forth much fruit (John 12:24). It is by bearing much fruit that He glorified the Father (John 15:8). A lily, according to the ancient writer Pliny, is the tallest of flowers and yet hangs its head down. This a beautiful picture of the greatness of the Son of God matched only by the greatness of His humility. "Who, being in the form of God, thought it not robbery to be equal with God: But made himself of no reputation, and took upon him the form of a servant, and was made in the likeness of men: And being found in fashion as a man, he humbled himself, and became obedient unto death, even the death of the cross" (Philippians 2:6-8 ). The lily has many medicinal qualities. According to ancient teaching, it could be used to restore a lost voice, help faintness, was good for the liver, and helped dropsy. The Lord Jesus Christ is the great physician and is fully capable of curing all diseases and maladies of the soul.